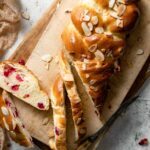 Recipe for Cranberry Almond Challah Bread, sweet and crunchy take on the traditional challah recipe. This loaf is perfect for breakfast, brunch, or holiday parties! Stir yeast and warm water into bowl for mixer. Wait five minutes until frothy. Add in sugar. Remove dough from bowl and knead in dried cranberries on a lightly oiled surface. Preheat Oven to 350 F (176 C) and line two baking sheets with parchment paper. Uncover loaves and transfer to cookies sheets. Brush dough with egg wash.(beaten egg and water stirred together) Sprinkle sliced almonds across the top. Bake loaves for 30-35 minutes or until golden brown. Cover loaves halfway through baking with aluminum foal to prevent over browning. Cool for 5 minutes, slice and serve warm! Store Bread in an air tight container for 4-5 days. Serve with spreadable butter and honey!